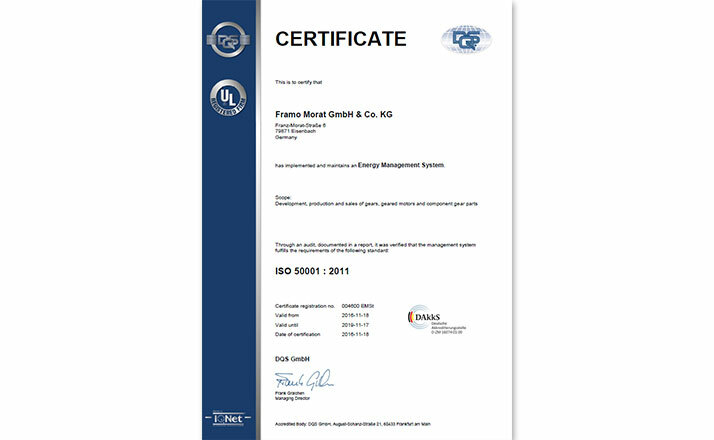 Framo Morat GmbH & Co. KG has successfully introduced an energy management system (EnMS) in accordance with ISO 50001:2011. The family-owned company based in the Black Forest is pursuing its concept of sustainability and systematically increasing its energy efficiency throughout all its operations. ISO 50001, a management system that regulates the requirements for setting up an EnMS, is characterized by the fact that the company’s management actions and measures can be tested for their effectiveness and are subject to a continuous improvement process. As a result, all areas within the company are linked together through the field of energy. The EnMS based on ISO 50001 fits perfectly into the existing gear and drive specialist’s management system, which already complies with the ISO 9001, ISO/TS 16949 and ISO 14001 standards. At the beginning of 2016, a project team began the process of integrating the requirements from ISO 50001 into the existing management system. The existing loads were measured, goals were defined and appropriate measures for increasing levels of energy efficiency were defined based on an energy analysis. The external certification authority, DQS, issued the ISO 50001:2011 certification in mid-November of 2016 (calendar week 46). “The goal of implementing this is to increase energy efficiency by reducing costs and conserving resources, which in turn will increase competitiveness and fulfill customer expectations and legal requirements,” says Martin Plé, quality and energy management officer of Framo Morat.